During yesterday’s “What’s New, What’s Next” presentation, Walt Disney World offered additional details and dates for the New Fantasyland expansion currently under construction at the Magic Kingdom. 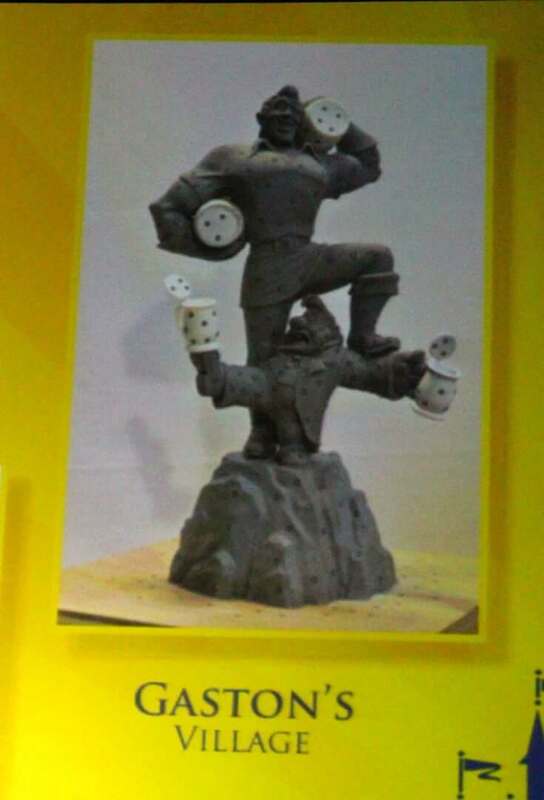 New artwork and construction photos were shared as well as a timeline for a few attractions set to open this year. Crofton then brought Imagineer Chris Beatty to the stage to reveal additional details about the ongoing New Fantasyland project. 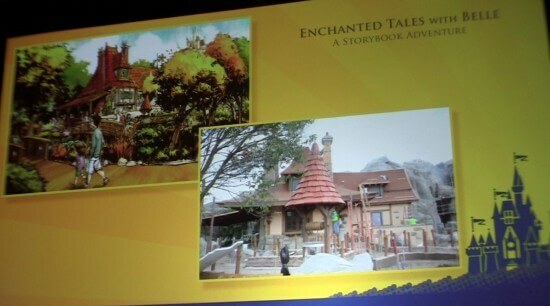 It has never been included in any timelines for the announced opening dates of parts of New Fantasyland. Beatty said it will be open “when we are done with the expansion,” insinuating that it will be one of the last elements to open, though Snow White’s Scary Adventures will have its last day of operation on May 31, 2012. But Snow White will not remain absent from the Magic Kingdom, not only appearing in Princess Fairy Tale Hall but also with a new ride, the Seven Dwarfs Mine Train. Beatty showed two images from the same angle, one concept art and the other a recent construction photo showing the scale of the roller coaster. As he mentioned during Thursday’s New Fantasyland construction tour, the brown steel currently seen in the park shows the height of the ride track and the grey steel shows the height of the land that will be built up around the track. 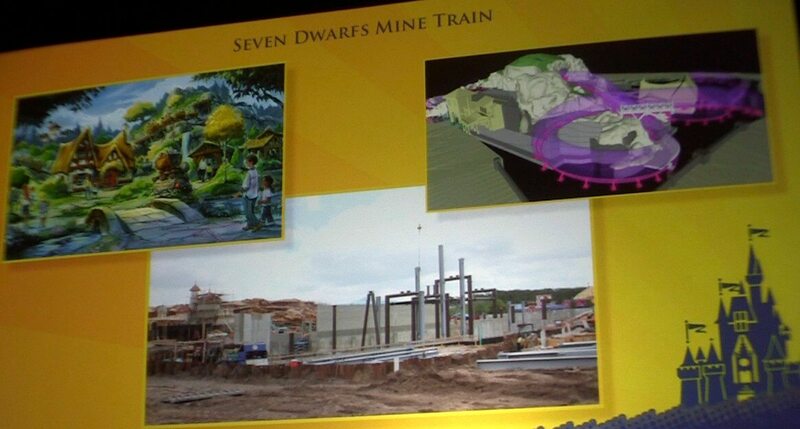 But the Seven Dwarfs Mine Train won’t open until 2014. Enchanted Tales will Belle is taking shape in the Beauty and the Beast area as the future home of an elaborate meet-and-greet with Belle. 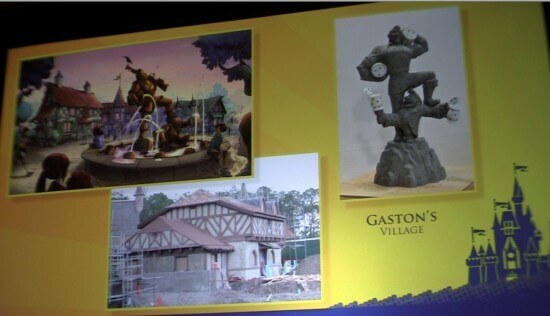 Gaston’s Tavern, Bonjour Village Gifts, and an elaborate statue of Gaston and LeFou were given a closer look in the presentation as well, opening with the Be Our Guest restaurant and Enchanted Tales by the end of 2012. 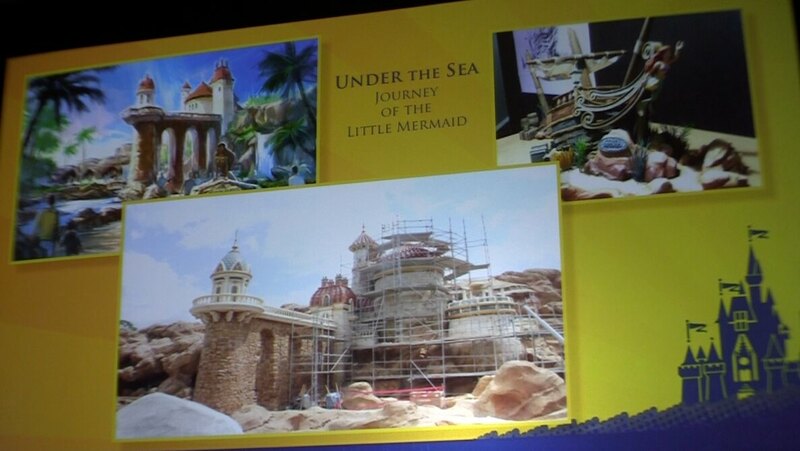 Under the Sea ~ Journey of the Little Mermaid features Prince Eric’s castle as its main facade, though guests will enter through a waterside grotto underneath. Though that castle is only seen briefly in “The Little Mermaid” it will still be a striking addition to the Magic Kingdom. 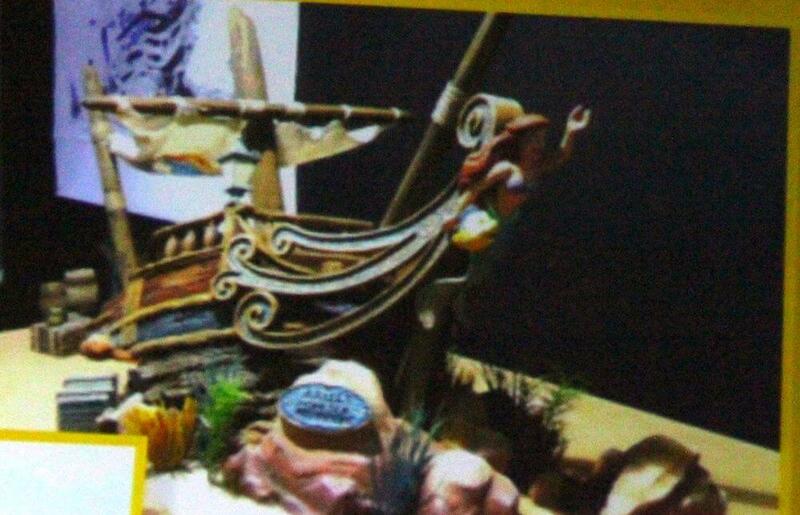 And as a tribute to the 20,000 Leagues Under the Sea attraction that formerly occupied that space, Imagineers are carving a small Nautilus submarine hidden in the rock work. Dumbo’s indoor, air-conditioned queue for both of its mirror-image carousels will be opening in July 2012. New artwork was revealed for the Casey Jr. Splash ‘n’ Soak Station, currently being installed inside Storybook Circus. 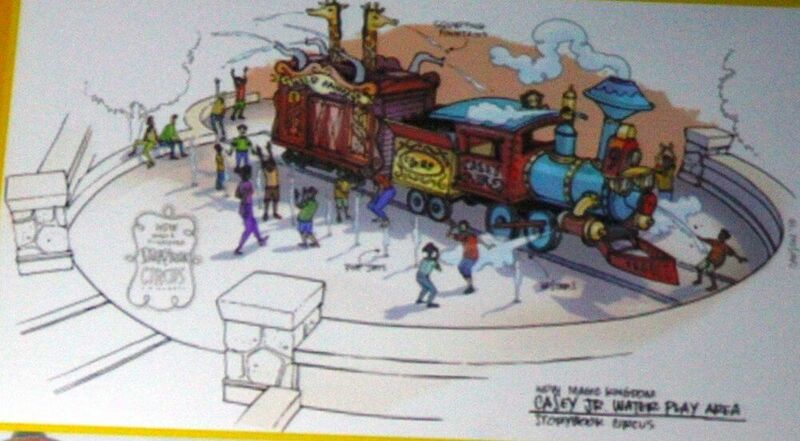 Like the rest of Dumbo, it’s set to open in July, featuring plenty of train cars filled with circus animals. 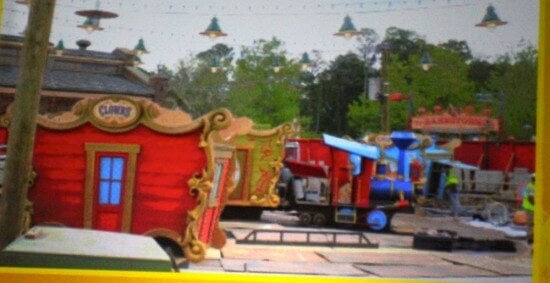 Though the next areas of Storybook Circus will open in just a couple months, it won’t be until near the end of this year that the first major areas of New Fantasyland will be revealed, those inspired by the classic Disney animated films “Beauty and the Beast” and “The Little Mermaid.” Those will be enjoyed throughout 2013 as the largest Magic Kingdom expansion grows closer to wrapping up in 2014. 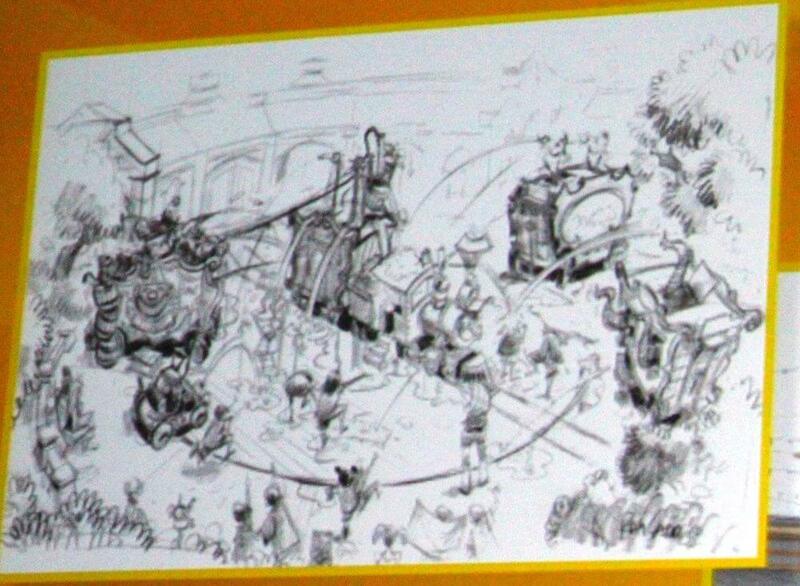 What is ging on with PETES SILLY SIDESHOW…i consistantly never see this mentioned..What is going in that Big Top? 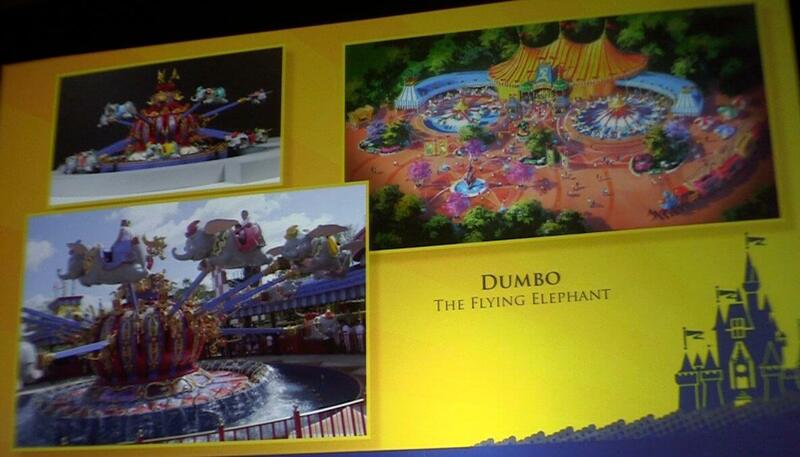 The big top tents will be a meet and greet and merchandise location. The specifics haven’t been released, as they’re like not decided yet. 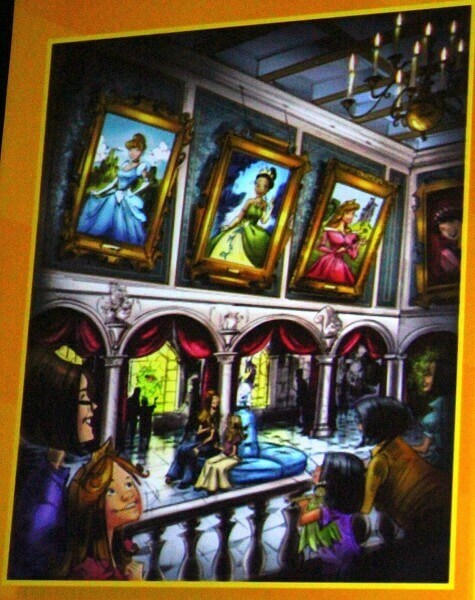 i’ve been looking on hundreds of websites looking for information on the NEWER things like how Aurora, Tiana, and Cinderella, (and possibly Snow White, and Rapunzel?) 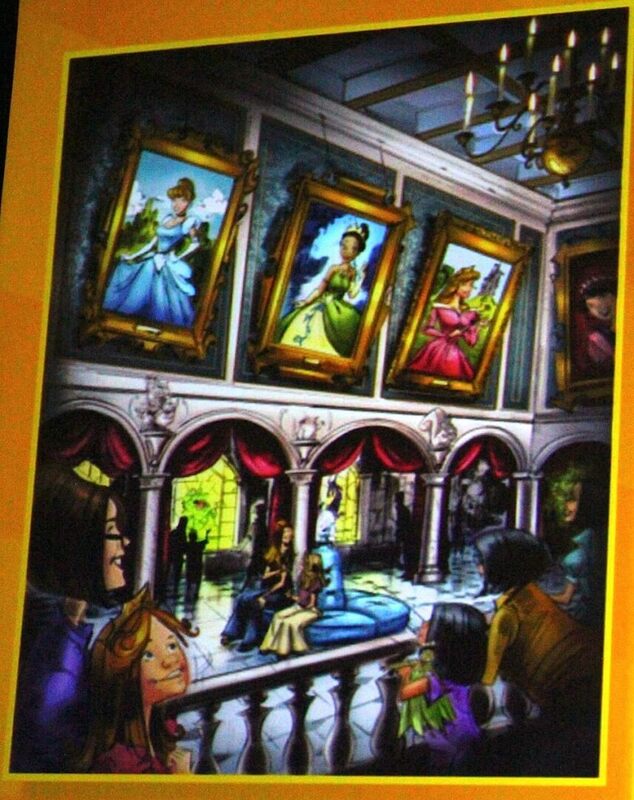 are having their own princess meet and greet, and most of all i want to know whats up with all that Rapunzel construction near Liberty Square and Its a small world,it looks like it might be one of my favorite parts of new Fantasy land. All the other princesses i enjoy thouroughly and know but it never occured to me that the imagineers would built a village about rapunzel a recent princess… BUT I REALLY WANT TO GO INSIDE HER TOWER. All the other princes and princesses have castles. 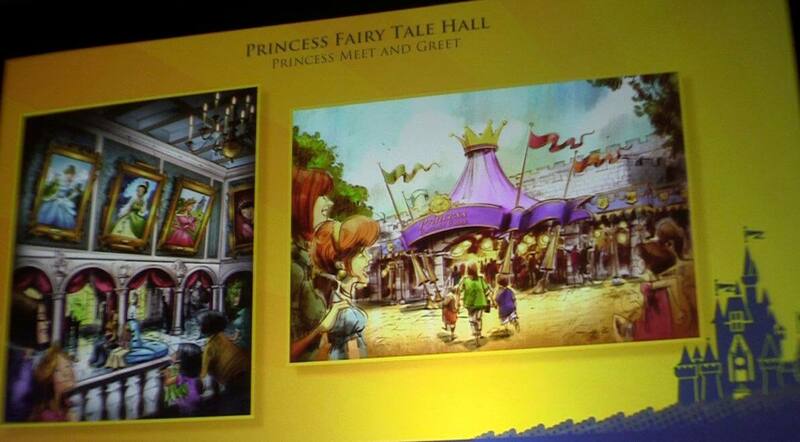 But RAPUNZEL has a tower. Cool much? Will there be a difference between The Little Mermaid DCA and The Little Mermaid WDW? Not on the ride itself. 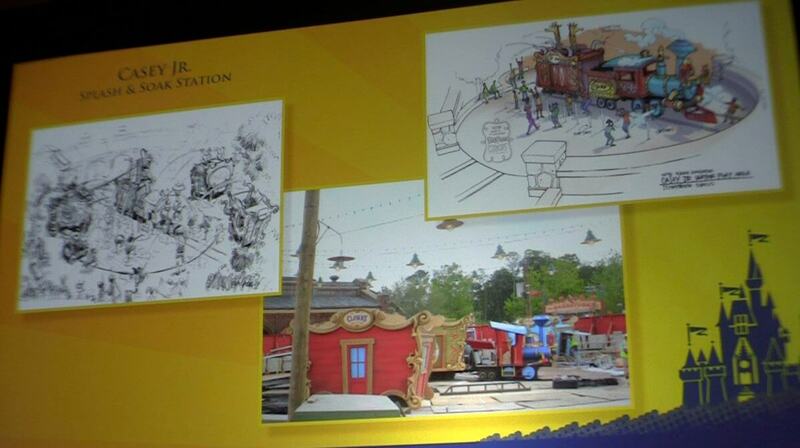 The exterior and queue will be quite different. i am so disappointed! i thought they will have the mickey mouse clubhouse. 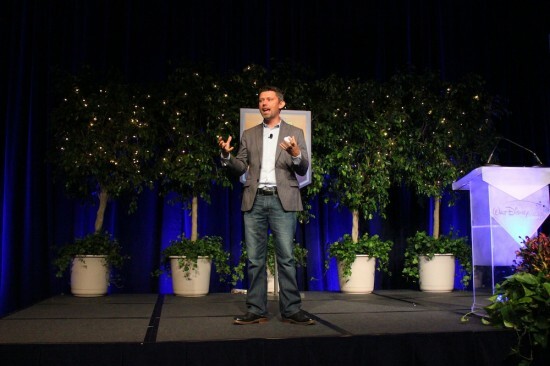 what month in 2014 will the expansion be complete or “wrapping up”? Disney hasn’t announced specific dates or months yet. Its time to give up the ghost…Mr Toad is GONE and it’s not coming back. No matter how nostalgic you are for it, children have NO idea who he is while Pooh is an enormous money maker…let’s all try and let it go and move on together shall we? 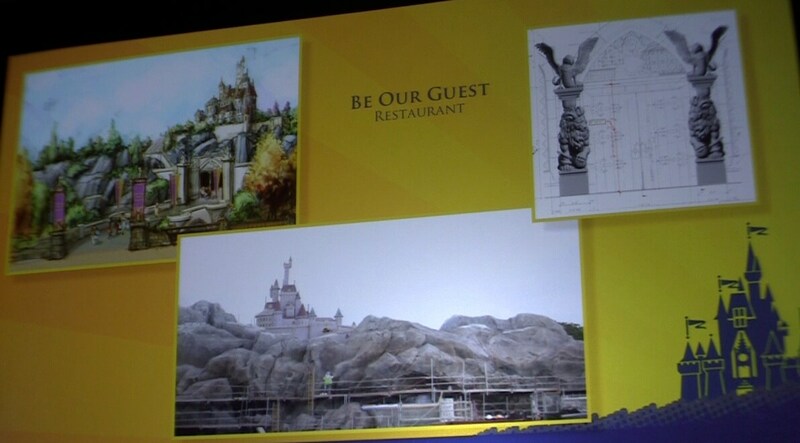 Will the Be Our Guest Restaurant be open the first week of December 2012? If so, how can I make reservations? It’s likely, but not firm yet. Disney has simply said “holidays 2012” for when it will open, which could be anywhere between early November to late December. 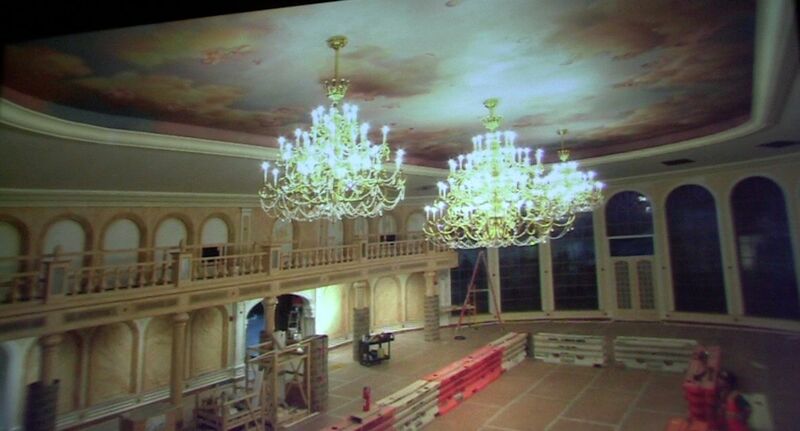 But reservations will be available beginning some time in August, at which point we’ll know a firm opening date. So check back in a few weeks. You should call Disney’s hotline and select the dining option. They can set up a time for you as best as they can. The later in the year you make your reservation the greater chance you will have of actually getting in.